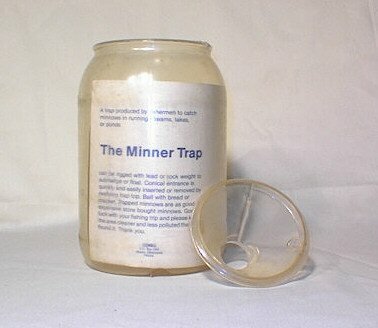 The Minner Trap "The Minner Trap" was sold by CEMBA of Miami OK, probably in the 1970s. Not much is known about the company. It probably didn't sell very well, and was discontinued after a short time. It is a plastic, gallon size jar with a plastic funnel that snaps into the top of the jar, and snaps out to remove the minnows.